Earners of this badge understand IBM Streams concepts: streams, tuples, operations, and the Python API. They know how to build streams apps using the Python API; run an app using the Streams Console; subscribe an app to a data simulator and filter to identify specific data; transform the tuples on the stream; and how to visualize the app's output data with Matplotlib on a Python notebook. 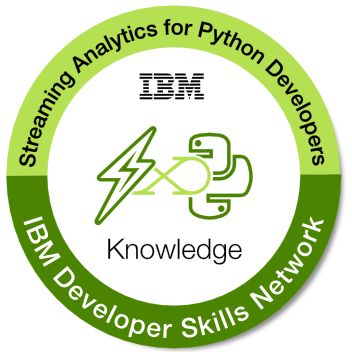 Completion of the developerWorks course "Streaming analytics basics for Python developers". Passing all in-course assessments with a score of 80% or higher.